The trend is one that has set in across the world, and over the last couple of years, has been spreading across Goa, perhaps debatably, to the point of saturation. We speak, of course, of the rise in the popularity of baking from home, and the people that undertake it. There are benefits over having a fixed outlet, without doubt, starting with lower overhead costs. However, in similar vein, there are also detriments in the form of the inability to buy raw materials in subsidised form, as this usually requires purchasing produce in bulk, which is not possible in a smaller operation. According to one source, a portal that speaks on wellness, baking is great for mental health, purely because cooking is meditative; nourishing activities feel good, baking stimulates the senses, baking is creative, and at the end of the day, the end products make other people happy- and who doesn’t love being able to do that? This all makes sense, of course. Any activity which takes your whole attention – especially if it's simple and repetitive – can have a calming, meditative quality. The process of weighing out butter and sugar, whisking eggs, beating and folding creates space in the mind, and eases negative thinking processes. Baking has always been a passion for my boyfriend, Irving Keith Viegas, and me. 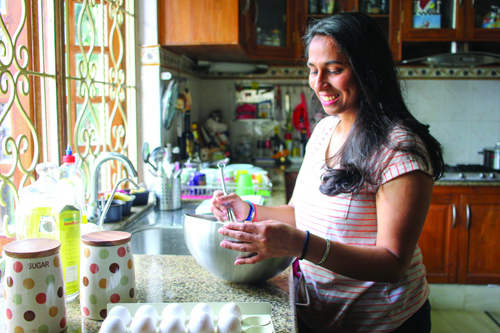 After we completed our education at Lavonne Academy of Pastry Arts in Bangalore, it seemed like the right time to take the business a step further. The market is better, in the sense that the customers know more today than they did five years ago, and hence they like to experiment with flavours, which is good for business. Baking from home means that we pay more attention to detail, as compared to otherwise working in a commercial unit where everything is done on a larger scale. It also ensures that our customers get freshly baked goods. I have been passionate about baking since the last few years, and the feedback of my family and friends motivated me to take it a level higher. It's been three years since I started my own brand, ‘Ribboned & Ready’, which belongs to me and my sister. The market is definitely better now, and is more beneficial for home bakers, as clients are more open to the trending concepts and ideas now, and they aren't hesitant in terms of the price, as long as their requirement is fulfilled. Working from home allows you to work at your own pace and time. Your orders are limited to feasibility. There is no wastage as your production is purely based on orders.